SpaceX's Falcon 9 broke apart shortly less than 3 minutes after launching on a cargo mission to the International Space Station on June 28, 2015. 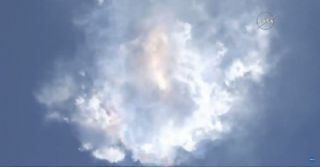 SpaceX thinks a steel strut holding down a bottle of high-pressure helium inside the Falcon 9 snapped on June 28, leading to a rapid "overpressure event" in the rocket's upper-stage liquid-oxygen tank. The strut was probably poorly made, since it apparently broke under a load of 2,000 lbs. (900 kilograms) of force, despite being certified to withstand 10,000 lbs. (4,500 kg), Musk said. The company plans to individually test every one of the hundreds of struts that flies on each Falcon 9 and will probably source the struts from a different supplier going forward, he added. Elon Musk founded SpaceX in 2002, with the aim of helping reduce the cost of spaceflight enough to make human outposts on Mars a feasible prospect. A certain level of paranoia marked the company's early days, when its relatively small staff was still learning how to build rockets, Musk said. But the fear of failure apparently subsided with every successful liftoff after SpaceX's last launch mishap, which came during an August 2008 liftoff of the company's Falcon 1 rocket. And that trend was likely amplified by the company's explosive growth, Musk said. In August 2008, "the company was only about 500 people, and now we're 4,000 people," he said. "So the vast majority of the people at the company today had only ever seen success. And when you've only ever seen success, obviously you don't fear failure quite as much." Before every launch, Musk added, he sends out an email company-wide asking employees to speak up if they can think of any reason to delay the liftoff. "The 20th time I send that email, it just seems like, you know, 'There's Elon being paranoid again.' It doesn't resonate with the same force," Musk said. "But I think now everyone at the company appreciates just how difficult it is to get rockets to orbit successfully, and I think we'll be the stronger for it." "SpaceX has demonstrated extraordinary capabilities in its first six cargo resupply missions to the station, and we know they can replicate that success," NASA Administrator Charles Bolden said in a statement shortly after the mishap. "This is a reminder that spaceflight is an incredible challenge, but we learn from each success and each setback."